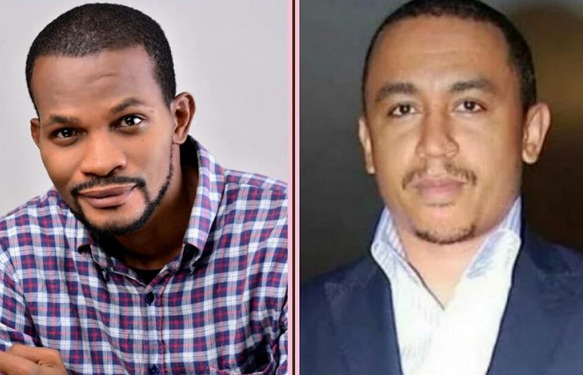 Actor Uche Maduagwu has blasted controversial media personality, Daddy Freeze over his preachings on tithes. Recall that Opeyemi had called her ex-husband, Freeze a Myopic man while promising to reveal all that transpired in their marriage. But Uche on his Instagram page, @uchemaduagwu asked OAP Freeze to put his energy in solving his personal issue rather than preaching against pastors and tithes. ” Charity they say begins at home, you spend so much time and energy writing against tithe on , but if only you can save just half of this #energy into finding a solution to fixing your marriage, maybe, we can start taking you serious. ”@daddyfreeze Apostle Suleman is like a #father to me, but you made me laugh when you said you wanted a debate with him, that thought pattern is obviously above your pay grade sir, but of course, even spiritual rascality is allowed in a country like Nigeria. “But first things first, work on fixing your marriage with Opeyemi, maybe, Nigerians will start taking you seriously, its just simple and pure logic, you can’t fix our religion, if you are not mature enough to fixing or saving your own marriage. Let's hear your view on this and like our facebookpage!! Bible says that we cannot know when the end will come, yet we are given definitive signs that foretell its coming. Part of these signs were explained in 2nd Timothy ch 3 vs 1-4 and second Timothy ch 4 from verse 3-4. This prophecy has been fulfilled today in Nigeria and in some parts of the world. The devil is now on the pulpit as teachers of the word of God to harvest people's souls. It is a clear misnormal for people who don't even go to church to be teaching the doctrine of the bible. Those people who do not even know how many chapters has the bible, has taken over the teaching of the word of God to mislead the children of God. Isn't it ridiculous that our friends who are not Christians and believers of Christ, are now teaching our Christian brethren the doctrine of the bible. Go to social media to confirm this, you will see that the devil has taken over the pulpit. This is no any other thing than the sign's of end time. This is another revelation, a confirmation that Jesus Christ is already on his way coming. He who has ear, let him hear what the Bible say: "For yourselves know perfectly that the day of the Lord so cometh as a thief in the night.For when they shall say, Peace and safety; then sudden destruction cometh upon them, as travail upon a woman with child; and they shall not escape. But ye, brethren, are not in darkness, that that day should overtake you as a thief." Thessalonians 5:2-4. Don't be caught unaware. The current controversies ongoing in the social media on the issues of tithe is another signs of end time that has just been revealed. When a voice from the beer parlour is calling on the children of God not to pay tithe, is indeed a sign that the end has come. The devil has taken over the pulpit. Nigerians should beware! They must beware of false preachers of the gospel who have been ordained to depopulate the kingdom of God. Pst Olumide Akinrinlola is a senior pastor in Mountain of Fire and miracle ministry.